4/5 Stars Rating From Online Lottery Shop! For many, the thrill of online lottery is equal to nothing else – the easy accessibility, the chance to pit your skills against odds and win is an experience that defies description. Well, online players can now add to their thrill and win big in yet another way- online lotteries. Although online lotteries are in the nascent stage and are great fun, even to the seasoned gambler, they still cause a little bit of flutter when they check their numbers each week. Lottoz is the newcomer in the lottery arena and is owned and operated by Morpheus Games MT of Malta. It is also stated to be the official ‘no frill service’ for global lottery players that love to take part in a wide range of lottery games from all over the world. The best part about Lottoz is its website, which is clean, simple and easy to navigate. At a glance, the home page informs players about the latest lottery jackpots, the latest winning numbers and the draw dates. Since Lottoz has only solo play games and the game cards and brand icons appear against a white background, they are easy to locate. The latest winning numbers are displayed in the left hand side of the website. You have a pull down menu that allows you to check the lottery you joined and check the winning numbers against it. Choosing numbers, buying and placing bets is very easy for online users just have to click on the numbers, choose the number of lines and draws and then head to checkout. Its cart feature allows players to buy multiple bet entries but checkout only once. As the website is mobile responsive, it can be used at home or even on the go. A live chat feature is automatically activated when you visit the Lottoz homepage and almost immediate responses are forthcoming. 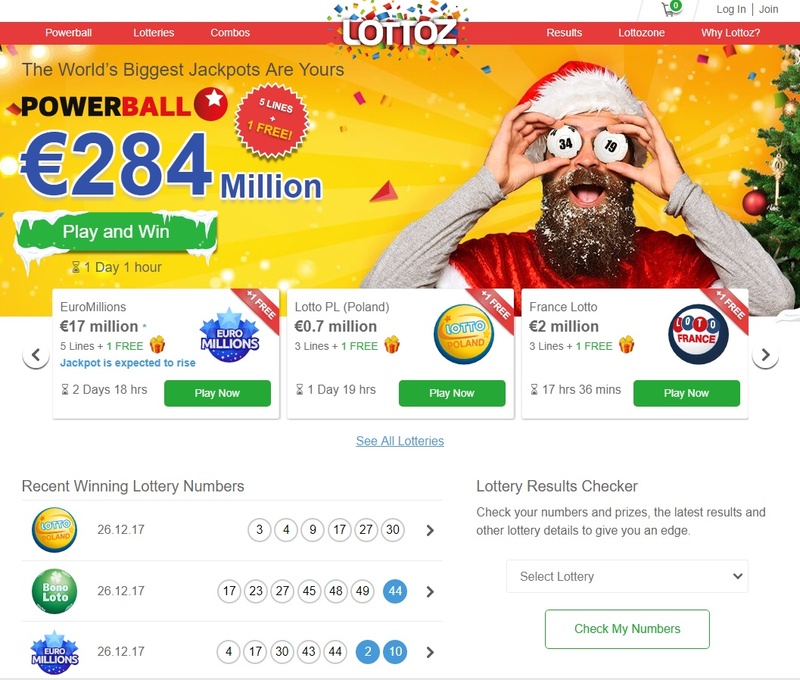 Lottoz also responds to emails, tweets and messages within 24 hours. Another interesting feature that Lottoz offers is that each game page has interesting tidbits about the game – this gives newcomers the means to get a hang on the basics about a lottery. As it also provides information about the odds of winning and the latest hot and cold numbers, choosing numbers is made a trifle easier. It also offer promos and bonuses on its ‘Daily Deals’ feature. As Lottoz uses Norton SSL to secure data, player details such as credit card details are not compromised. It has strict gaming standards and is regarded as a responsible online lottery site. Although Lottoz does offer a good lottery experience, there is scope for improvement. Payments methods are limited to just 3- more options would be better. When players withdraw money, they have to abide by the minimum withdrawal amount and even these payments are not immediate. Players sometimes have to wait for a period of 10 days. The best part is that your winnings remain intact and Lottoz doesn’t charge commissions on them. Although the number of games is limited to just 16, these games are some of the most popular ones from different parts of the world. As of now it offers only solo play games and nothing else. Lottoz.com is growing, learning and improving – soon its growing pains will vanish. Do you have comments? Want to submit your own review of this online lottery service provider? Write to us here and we will update our review with your comments or add your own personal review to our website!